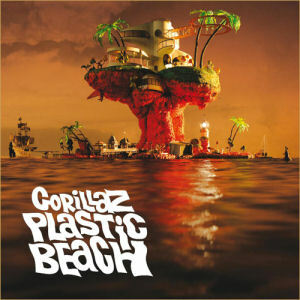 RapReviews.com Feature for March 16, 2010 - Gorillaz' "Plastic Beach"
The concept of virtual reality has become increasingly familiar to the average Joe in the last 20 years. Previous to that it was largely the domain of science fiction and Hollywood thrillers, made menacing by the likes of Jobe Smith in The Lawnmower Man or as familiar and friendly as a Star Trek holodeck. The emergence of the world wide web made the concept much more accessible to the layperson as the internet was no longer a text-only world, and one could not only conceive of but participate in realities that only existed electronically. The graphics have only become more realistic as hard drives and computing power grew exponentially, leading to interesting moral and philosophical debates about the nature of reality and what if any limits should be placed on role-playing games and simulations of real life. Increasingly the lines between what is real and what is computer fantasy have become, shall we say, BLURRED. Enter Damon Albarn. This unconventional musician had already tasted the heights of pop culture success before he conceived of an entirely virtual band, one that could only be expressed through animation (electronic or otherwise) that was entirely the product of his musical vision and Jamie Hewlett's artistic vision - the latter perhaps best known for the groundbreaking comic book series Tank Girl. Could you really market a band that doesn't even exist to the public at large? How do they tour to support a new album? How do they film music videos? How do they do radio show interviews? As it turns out The Wizard of Oz provided the object lesson - so long as you pay no attention to the man behind the curtain, it all works. You allow Albarn and Hewlett to construct a virtual reality, stick their virtual band into it, and interact with that virtual world just like the real one while they pull the strings. The release of musical albums bridges the world between both realities, moving you from one to the other at will. You buy them because you interact, you interact because you buy them, or both - perhaps neither if you're close-minded or virtually-impaired. Albarn's willingness to embrace urban soundscapes from R&B, hip-hop, dance and techno ensured that "Demon Days" with its lineup of guests from De La Soul to Del the Funky Homosapien could bring this reality to even the most jaded of listeners and make them converts to the Gorillaz' virtuality. When you're close to me"
Welcome the world of the plastic beach"
A plastic beach might be a more realistic proposition in Long Beach than the real thing if the gangland wars Snoop has rapped for are themselves believable and not virtual. He's far from the only hip-hop contributor though - Gruff Rhys and De La Soul combine on the breakfast commercial parody "Superfast Jellyfish," Mos Def and the aforementioned H.B.E are out to win the "Sweepstakes" on an uptempo electronic genre breaker, and you can also hear Mos rocking from coast to coast on the album's first single "Stylo." It's exactly the kind of blending of hip-hop and pop that has made songs like "Feel Good Inc." huge hits for the Gorillaz in the past, and one suspects that "Stylo" will only continue to seep into the pop culture landscape further and wider in the months and years to come. To be fair though "Plastic Beach" may be just a little too virtual and esoteric for some of the faithful RapReviews readers. As a critic I find it easy to embrace the artistic experiment that this simulated band represents, and I can hear enough hip-hop influence in songs like the title track featuring Mick Jones and Paul Simonon that I can still relate to the sound. Songs like "Glitter Freeze" push that envelope to its furthest extent, where Albarn's sound becomes a plastic trance dance more at home with pulsing dancefloor strobe lights than a booming club with a DJ spinning the hottest rap hits. That may be a step too far for some. Tracks like "White Flag" and "Cloud of Unknowing" walk the line between those extremes. While "Plastic Beach" may not be for everyone, I have no problem visiting their non-sandy shore and still wanting to come back for more.